So I was watching the Sandwich King show one day, and Jeff Mauro made some tacos al pastor, which I believe is one or the most popular tacos in Mexico. Pork and pineapple, how could you go wrong? I also made the corn tortillas at home which were fairly easy. I wanted to have tiny ones, and you just can't buy those in the store from what I've seen. I also didn't have a tortilla press, so I was pressing balls of dough with a plate. 1. If you are going to make your own tortillas, you'll want to make them ahead of time. The number of ingredients really isn't a lot, and they aren't too complicated to make. Though maybe hard to master, and make them perfect. If you have a tortilla press, great! If not, like me, just press them with a plate. 2. On the back of your masa flour (corn flour) there are probably directions. Basically combine masa flour with water and salt. Then form them into little balls. Press them with a plate wrapped in saran wrap so that they won't stick. While you are working, you might want to cover the tortillas or dough with a wet paper towel to keep them from drying out. 3. In a frying pan, or cast iron pan, cook the tortillas. About 1-2 minutes each side. They will bubble and turn brown a little bit. That's when you know they are done. 4. To make the pork. Cut your pork into small pieces. If you can, marinate the pork overnight for optimal flavour. While your pork is marinating, you can dice up some red onions, and chop some cilantro to top on your tacos. 5. Grilled or fry some sliced pineapple, or use pine apple juice. Put it in a food processor with some chipotle peppers in adobo sauce (or use cayenne pepper if you don't have any), garlic, cumin, salt and blend. Mix the sauce with the pork, and put in a freezer bag to marinate. 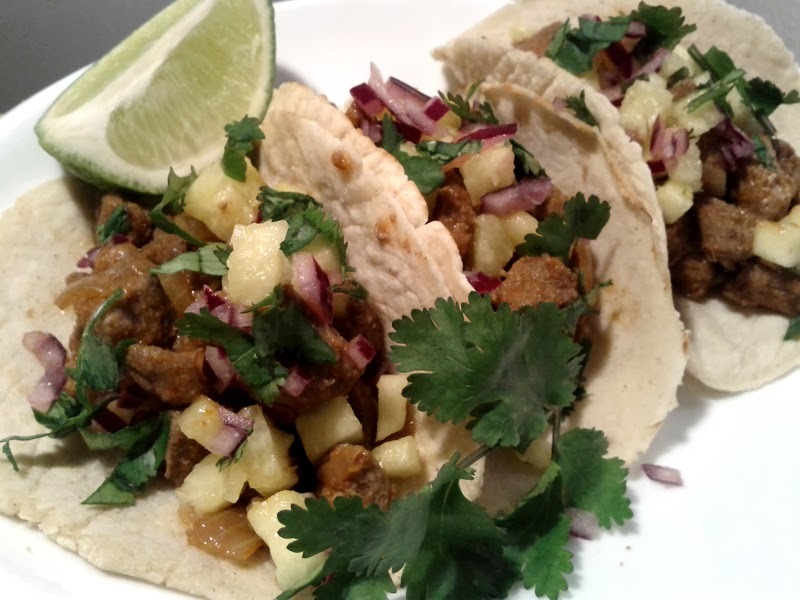 Set some pineapple aside if possible, and cube it to top on your tacos. 6. Pull out freezer bag, and in a cast iron pan or frying pan. Cook the pork in some oil. Turn and flip it around to make sure all sides get cooked. 7. When the pork is cooked. Spoon over your tortillas, and add some cubed grilled pineapple, diced red onions, and chopped cilantro. Put some limes on the side that you can squeeze on before eating.